Looking for a refreshing dessert this holiday season? 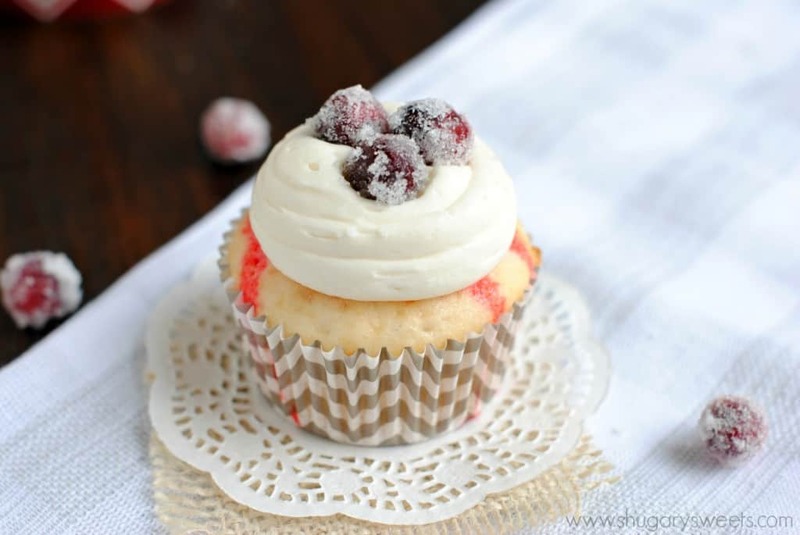 Make a batch of these White Chocolate Cranberry Poke Cupcakes. And don’t forget the sugared cranberries on top!! I hope it’s not too soon to start sharing holiday desserts? This one is so good, you can’t wait to share it! I’ve made many poke cakes in the past here on Shugary Sweets! I love the combination of cake, JELL-O and COOL WHIP. It’s a refreshing dessert that everyone enjoys! I mean really, as the saying goes, there’s always room for JELL-O. 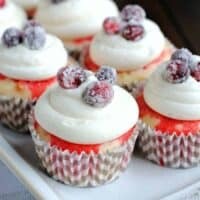 I only put three cranberries on each cupcake. Which meant I had a whole bowl of sugared cranberries leftover. They were perfect little snacks every time I opened the refrigerator. If you’re making a fruit platter this holiday, I suggest making these sugared cranberries to sprinkle around the platter. Not only are they festive, but oh my gosh they are delicious too! Now that we have moved back home to family, we are trying to coordinate some Sunday night suppers. A few weekends ago we had a chili cook off at my mom’s house. My brother’s and their families were all attending! After eating the varieties of chili, these sweet cupcakes were the perfect finish after dinner! The melted white chocolate in the cream cheese frosting adds a delicious flair to this cupcake. For the cranberries, you’re going to let them sit overnight in a sugar water syrup. When you combine the sugar and water in the saucepan over low heat, stir just until the sugar is dissolved. The syrup won’t be very hot (don’t let it get too hot)! If you do, let it cool before pouring it over the cranberries (otherwise your cranberries will pop open…not the goal. Once the syrup has soaked into the cranberries overnight, drain off the syrup completely. Let them sit for about 15 minutes before adding the sugar. The best way to do this for me, was to put the sugar in a large gallon sized ziploc bag. Shake the cranberries in the sugar gently. Lay a piece of foil on the counter with a wire cookie rack over it. Pour the sugar and cranberries onto the rack. The excess sugar will fall through the wire rack. Let sit until the sugar hardens (about an hour). For the cupcakes, bake according to your white cake package directions (for 24 cupcakes). Immediately after baking, poke fork holes all over the top (going about 3/4 of the way deep). Combine JELL-O Gelatin and boiling water. Mix with a spoon until completely dissolved. I used a spoon to pour over each cupcake. Press the spoon gently into the top of the cupcake, allowing the Gelatin to pour into the fork holes. I made my cupcakes at the same time as the sugared cranberries. Then refrigerated both overnight. 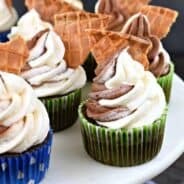 Technically the cupcakes only need about an hour in the fridge, but if you want to make them the night before, it works great! For the frosting, be sure to beat the butter and cream cheese until fluffy before adding the melted white chocolate. 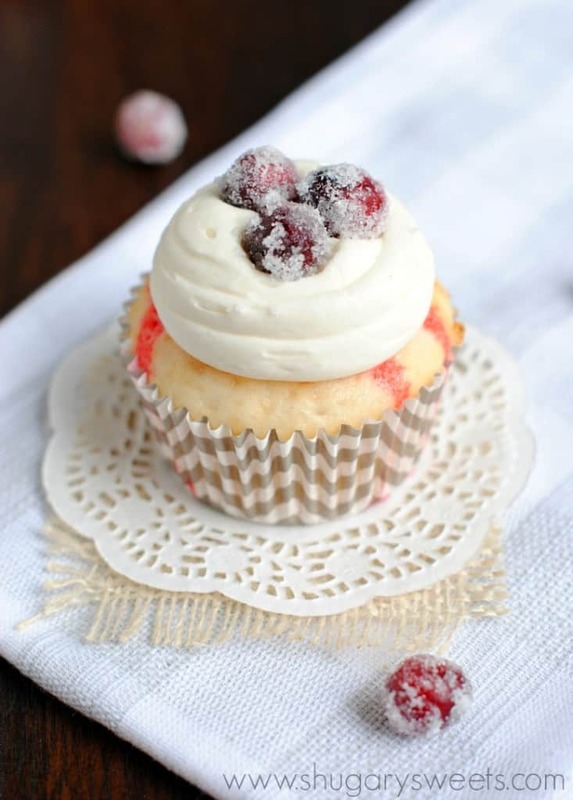 Once you’ve piped your frosting onto each cupcake, top them with your prepared sugared cranberries for a sweet garnish. You’ll have plenty of extra cranberries to put in a bowl and enjoy as a snack too! 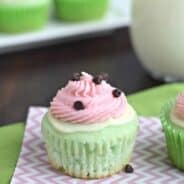 Keep your frosted cupcakes in the refrigerator until ready to serve. The frosting may harden slightly, but it will taste amazing! So there you go! As you start preparing for the holidays, keep these sweet treats in mind. They are perfect for classroom parties, potlucks or weeknight desserts! ENJOY! I love the looks of these…the cupcakes, the frosting. And those sugared berries!! Is it wrong that I just want to pluck them all off? 🙂 Pinned! Not wrong at all 🙂 It’s a good thing it makes a whole extra bowl of sugared berries, just for snacking! Thanks for pinning Averie!! These cupcakes are GORGEOUS! I just LOVE those sugar frosted cranberries – so festive! These could not be more perfect. You put all those swanky cupcake chains to shame, Aimee! I don’t think the sugared cranberries would last long enough to make it on the cupcakes! Pinned. 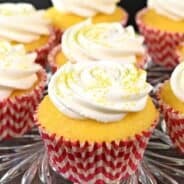 I have never thought of putting a poke cake into a cupcake, I love that twist! I love the combination of fresh cranberries and white chocolate, and making poke cupcakes instead of a regular poke cake is genius! Definitely NOT to early. Bring it on! Love these festive cupcakes! These are such a great idea, Aimee, and they’re gorgeous! I just love those sugared cranberries on top! I can’t get over how beautiful these are! 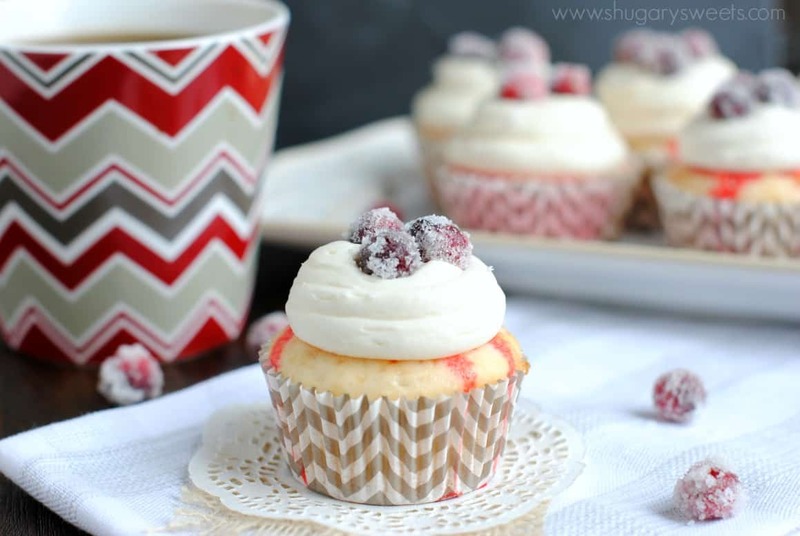 These are definitely the ultimate holiday cupcake! 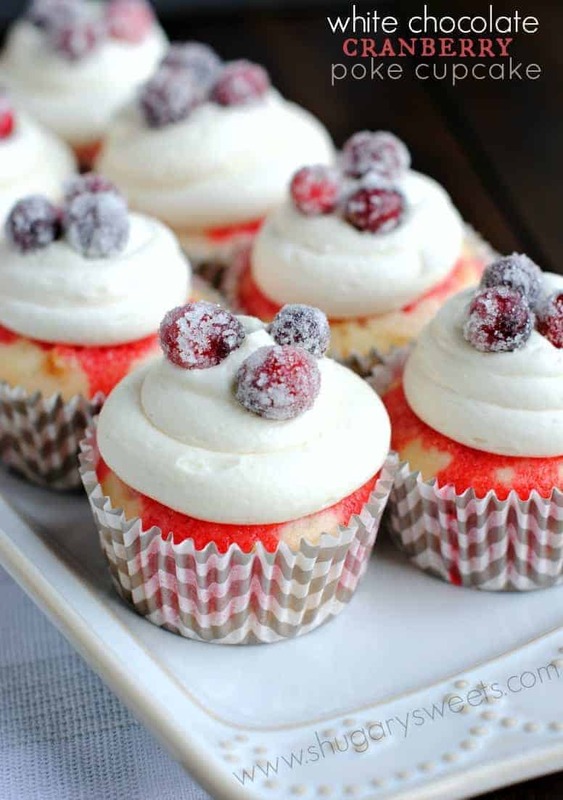 I totally want to just grab all those gorgeous sugary cranberries of the tops of these cupcakes! This is such a fun and gorgeous cupcake! 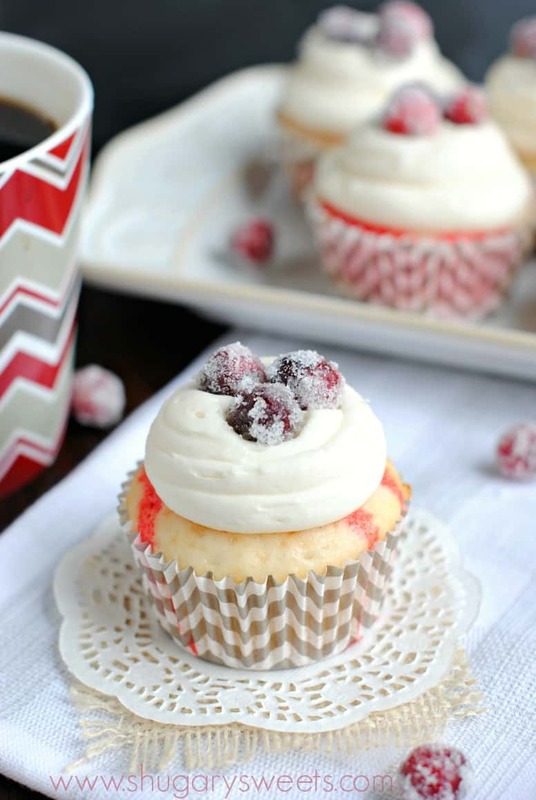 The sugared cranberries are so pretty on top of that silky frosting! These cupcakes are just SO pretty!! The bright colors, the cute cranberries, all of that frosting… May I eat half a dozen? Pretty please? If I offer to do the dishes? 😉 Pinned! haha, thanks for pinning Betsy!! Beautiful cupcakes! I love the addition of the cranberries on top of the frosting.